Today, while shopping for a special hearing device for my 95 year old mother, I drove to a medical supply business that is near the airport and a bit away from the typical shopping area. As I walked in, the sign stood out, "________Supply Bans Guns in These Premises". 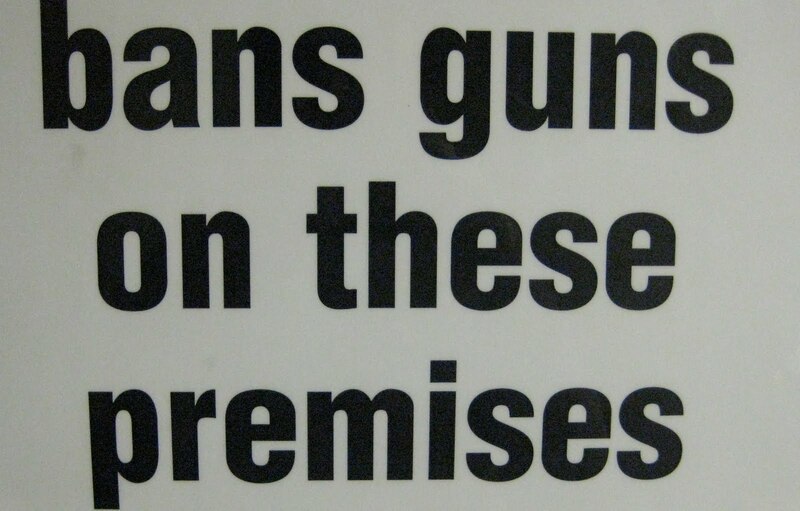 After Minnesota passed the "Citizens' Personal Protection Act" in 2003 allowing permit holders to carry guns on their persons, the law allowed businesses and organizations to post very specific signs with very specific wording in a spot that had to be posted at a certain height outside of the business or organization. Initially, when the law passed in 2003, there was a lot of confusion over the posting of the signs and also having someone inside the establishment have to inform every customer that their guns were not welcome inside. 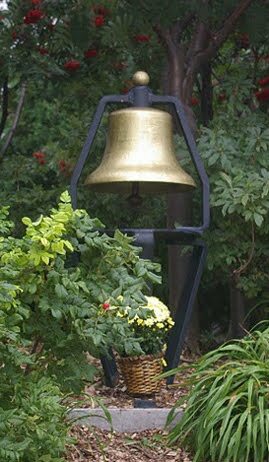 But then, because of the lawsuit filed against the state of Minnesota by churches, the law was deemed unconstitutional until 2005 when it was passed again. This time, the law clarified that an establishment could either inform people or post a sign. So coming across this sign today reminded me about why we should need to post signs to ban guns anyway. Apparently, some businesses just plain do not want loaded guns inside of their places of business, for obvious reasons. I don't think shopping malls and restaurants are particularly dangerous places. Some people do, I guess. Those who do seem to need their guns at the ready for anything that might come up. The problem with this outlook is that sometimes things that don't require intervention with a gun do come up. And sometimes accidents happen, as in Seattle to this poor man who accidentally shot his testicles with his gun which was concealed in his pocket. Ouch. Accidents to happen with guns every day. The argument on the side of allowing concealed and openly carried loaded guns in public places was that the permit holders would be law abiding citizens who are trained to protect themselves and the public from all those boogey men hiding behind every shopping counter or tree in the parks. I don't know about you, but I have not heard about too many incidents in which that has happened. Rather, what I am hearing are more frequent cases of permit holders shooting themselves or others accidentally or involved in shooting someone else intentionally. So much for protecting us all!! As a citizen who does not choose to carry a loaded gun with me everywhere I go, I appreciate the courage of businesses who post their signs. In earlier posts, I wrote about Starbucks refusing to post such signs even when presented with petitions asking them to do so. It is legal for them to prohibit loaded guns inside of their stores, but they have so far resisted all efforts to get them to do so. 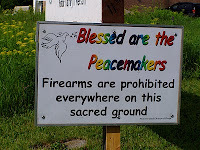 Even though the signs may not be able to stop a shooting inside of their place of business, it is the message that is important. We don't need guns everywhere we go. I suggest that you check out places you frequent to see if there are signs posted. If not, why not. Shootings can and do happen everywhere and anywhere. Why risk it?